Outside of Japan, think tanks like the Breakthrough Institute in the United States seem equally concerned that phasing out Japan’s nuclear power and replacing it with renewables would be too costly. They argue that producing the 203 Gigawatts (GW) of solar capacity to meet the energy shortfall would cost Japan the equivalent of US$1.01 trillion. Alternatively, if wind energy were used, then 152 GW of newly installed wind capacity would cost $375 billion and take up 50% of Japan’s land area. While the financial cost of transitioning to renewables may be high, one major concern is that Japan would instead fast-track building of thermal, fossil fuel power stations to replace the Fukushima nuclear plants and as a result undermine efforts to move towards a low carbon society. The Breakthrough Institute shares this concern and argues that replacing all nuclear power stations in Japan with natural gas and coal plants would increase current carbon emissions by 10%. George Monbiot, columnist at the Guardian, entered the fray almost immediately after the Fukushima accident by supporting the need to stick with nuclear power . He argues that “… like most environmentalists, I want renewables to replace fossil fuel, but I realise we make the task even harder if they are also to replace nuclear power”. For Japan, the challenge is not only to replace four (and possibly all six) nuclear reactors at the Fukushima Dai-ichi plant, but to reconsider the plans to build nine new nuclear power plants by 2020 and more than 14 by 2030. Still, the vested interests (including the ten regional electricity providers and the companies that design the plants — Toshiba, Hitachi and Mitsubishi) and financial resources backing nuclear power in Japan are immense and as a result the chances of alternative low or no-nuclear energy scenarios receiving an objective hearing by policy-makers are slim. This is unfortunate because any measures that Japan takes now could fundamentally influence future global energy policy. As Anthony Froggat from Chatham House points out, nuclear power currently only accounts for 6% of global energy and is a concern for just 30 countries, of which six are major players — the US, France, Japan, Germany, Russia and South-Korea. If a country like Japan, that has very few natural energy resources, was to find a new energy pathway that involved little or no nuclear and no fossil fuels, then this would prove highly influential internationally. Discussions around the merits of an energy strategy (sometimes referred to as the “soft path” proposed by Amory Lovins) based on a combination of greater energy efficiencies and the more extensive use of renewable energy frequently point to their limitations. George Monbiot elaborated recently upon why this kind of energy strategy encounters problems, stating that powering down and producing energy locally sounds lovely “until you read the small print”. The mantra goes like this: energy demand is predicted to grow and grow, and we need reliable, cost-effective, low carbon energy sources. While renewables are ideologically attractive, they are expensive, unreliable, and come with their own environmental costs (visual intrusion, noise pollution, etc). Powering down is something that, on the surface, looks impossible. But maybe the Fukushima accidents will trigger a rethink of this assumption. With the power outages, we are witnessing the ability of people in eastern Japan to significantly reduce their electricity consumption without their quality of life being greatly affected. Many of Tokyo’s iconic neon signs have been switched off, as have surplus-to-requirement lights at train stations and in shops. This has shown, without doubt, that there is considerable wastefulness or luxury in how electricity was used before the accident. It seems the impossible is possible, given the pressure of absolute necessity. A further by-product of these restriction is that the Japanese public are learning a lot more about how they get their electricity, even if they are not being offered the chance to decide what kind of electricity they would prefer. Still, some energy-related choices are being exercised. Japanese businesses have begun exploring modes of production that take advantage of off-peak electricity, including running their factories through the night. There is also talk of increasing the price of electricity at peak so as to better manage demand and to spread the load. The idea of introducing daylight saving (i.e., bringing the clocks forward in the summer to take advantage of the fact that it is light at 5 a.m.) is being mulled over once again. Interestingly, the lights on every vending machine in Tokyo have been turned off. If things got even worse, all 5.2 million of Japan’s vending machines and perhaps the 16-17,000 pachinko parlours (pachinko is a very popular pin-ball gaming machine used for amusement and gambling) could be closed down, which might allow for the decommissioning of a couple of nuclear power reactors right away. For instance, while the energy efficiency of the vending machines has increased dramatically in recent years, each vending machine still consumes at a rate of 1,046 kWh/year. Politics, however, plays more of a role in deciding energy policy than technical feasibility. Understandably, there would of course be considerable opposition, for example from the vending machine and pachinko lobbies, to any drastic changes affecting their business operations. Nevertheless, the disaster at Fukushima has allowed us to see what is possible with energy and we have the chance to re-think the situation with open minds. Is it time for an energy shift? The way that the public has been able to significantly reduce its electricity consumption in this crisis situation begs the question of whether or not Japan really needs nuclear power at all. One long time advocate of renewable energy in Japan is social innovator Tetsunari Iida, Executive Director at the Institute for Sustainable Energy Policies (ISEP). Iida argues in a recent paper entitled “From unplanned energy outages to strategic energy shift” that Japan is experiencing its third historic reset with the Tohoku-Kanto triple disaster of earthquake, tsunami and nuclear accident — the first reset was the Meiji Restoration in 1868 and the second was the end of World War II. The central argument Iida makes is that although various stop-gap measures are likely to be implemented to overcome the anticipated high electricity demand in the summer months as everyone switches on their air-conditioners, the only realistic long-term response is to promote an energy shift to 100% renewables by 2050. To meet this target, however, Japan would also be required to reduce its electricity consumption by 50% compared to 2010 levels through energy efficiency and power saving measures. As an interim target, Iida argues that Japan should reduce electricity consumption by 20% by 2020, while renewables could grow from around 10% of electricity supply in 2010 to 30% to 2020. Iida is in favour of phasing out nuclear power gradually, dropping from 25% today to 10% in 2020, to zero in 2050. Natural gas would remain at 25% in 2020, while coal and oil would drop from 40% to 15%. 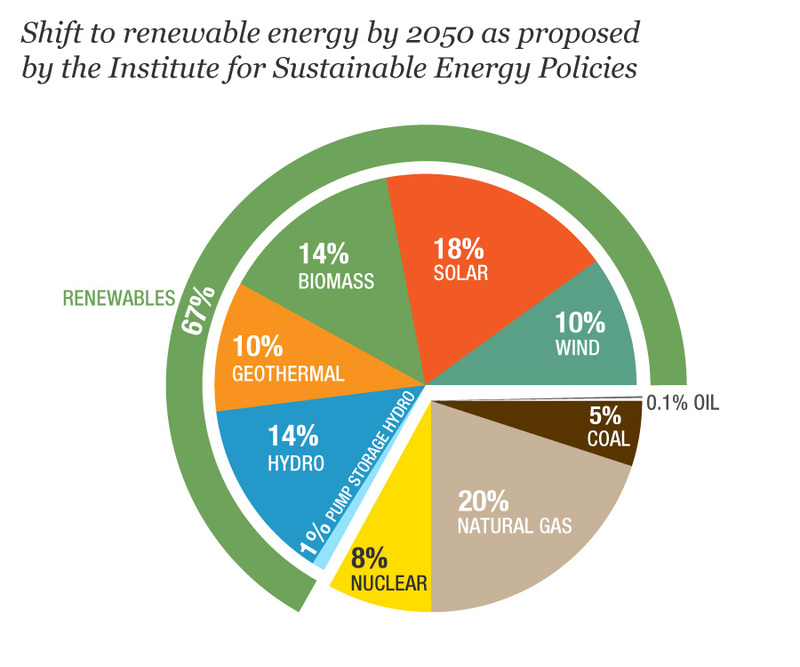 All would be removed as sources of electricity generation by 2050. 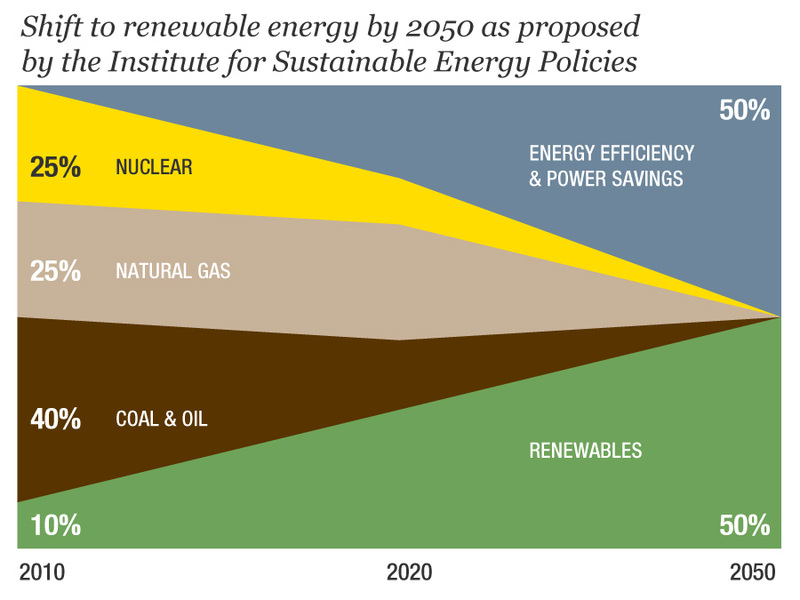 Under this scenario, nuclear and fossil fuel based electricity production are viewed as a short-term, stop-gap measures in the shift towards renewable energy. Iida has been working on these proposals for years and in 2008 helped to establish the Japan Renewable Energy Policy Platform (Japanese only) that brings together various bodies including the Japan Wind Power Association, the Geothermal Research Society of Japan and the Solar System Development Association. One of the first tasks of this platform was the publication of a 2050 Renewable Energy Vision indicating that Japan could supply 67% of its electricity needs from renewables by 2050. In their combined plan, each member of the Platform took responsibility for the development of the projections for their sector. So for instance, the Japan Wind Power Association developed three scenarios: (a) business as usual, (b) 5% of all electricity, and (c) 10% of all electricity. 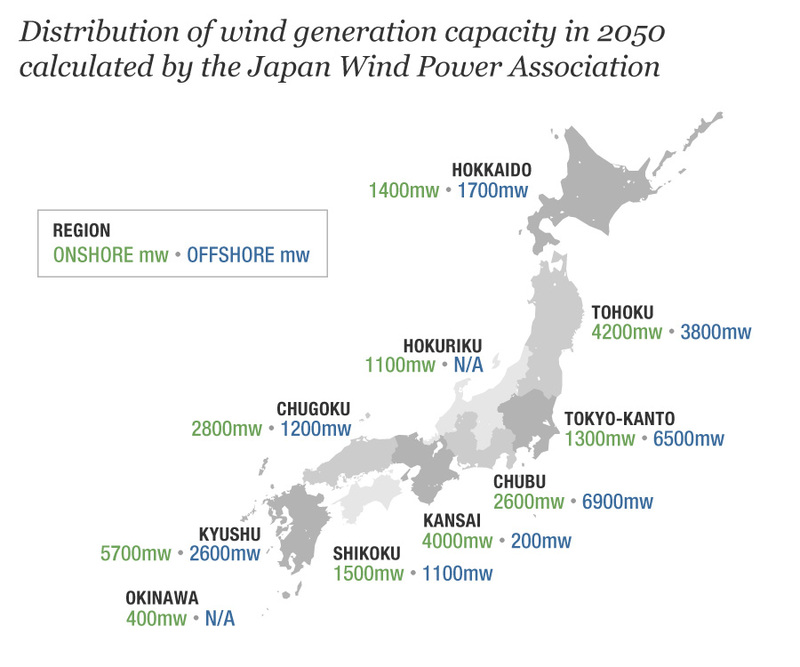 In the latter scenario, they estimated that wind could supply up to 50,000 MW (up from 3,000 MW in 2010) with half being located offshore, largely in the Hokkaido and Tohoku regions. 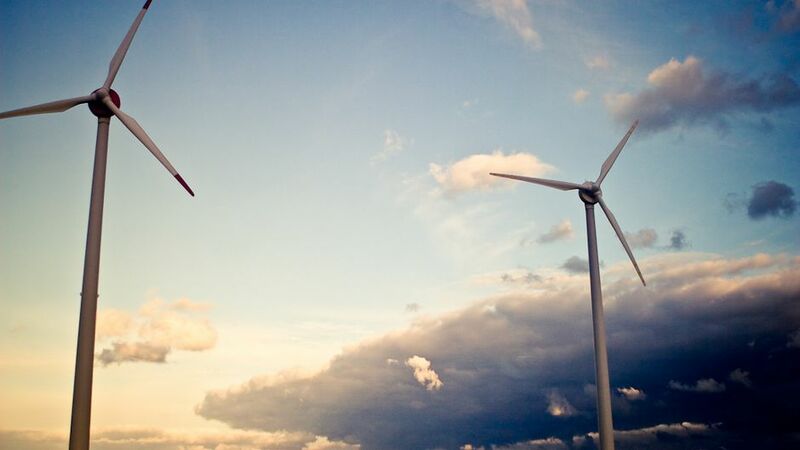 Beyond the usual challenges of obtaining accurate cost data and dealing with uncertain future weather conditions (e.g., seasonal typhoons impacting on wind farms), the biggest concern is that these renewable energy proposals may be ignored by policy makers yet again. Past energy decisions in Japan have been biased in favour of nuclear power and centralized energy systems because this is where the influential energy industries have their domain. The ten powerful electricity supply companies, including Tokyo Electric Power Company (TEPCO), have made modest efforts to develop renewable energy resources. For instance, TEPCO’s long-term goal is to develop only 400 MW of new renewable energy (mainly wind) by 2020 in the Hokkaido and Tohoku regions. As a result, Japan is clearly falling behind other industrialized countries in the renewable energy race and in 2010 was only investing in solar power at any significant level. 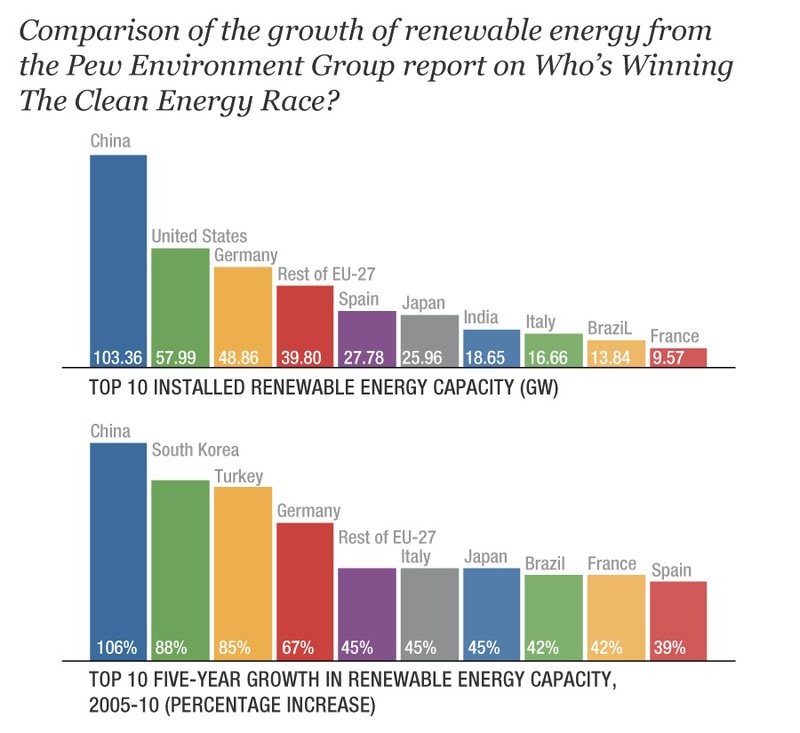 The March 2011 report by the Pew Environment Group entitled “Who’s Winning the Clean Energy Race” shows that China is surging ahead — attracting a record US $54.4 billion in clean energy investments in 2010. While Japan is the third largest economy in the world, it is ranked 5th in terms of its installed renewable energy capacity, with India rapidly catching up. In the past five years, according to the Pew report, renewable energy has grown by 45% in Japan, compared with 108% in China. Recently numerous studies have concluded that the entire globe could go renewable between 2030 and 2050. Researchers at Stanford University published the results of their work in the Scientific American in November 2009, arguing that that we can power the world on 100% clean energy (not including nuclear) within 20 years. They have a website that provides all the supporting data and various presentations. In commenting on the situation in Japan, Professor Mark Jacobson, lead researcher in the Stanford team stated that, based on their global modeling, it is possible to conclude that Japan has strong wind resources and reasonable solar mainly in southern regions. He explained that the “key is to combine real renewables (wind, concentrated solar power, photovoltiacs, geothermal, hydroelectric, wave, and tidal) into a bundle to match hourly supply with demand”. Jacobson’s team showed that this could be done for California, where they found that renewables were able to match hourly demand 99.8% of the time over two years. “Only 0.2% of the hours needed back up. Those could be eliminated by demand response,” he explained. Another study by Ecofys supports the general conclusions of the Stanford University team, and argues that the world can meet 100% of global energy needs by 2050, although approximately half of the goal is met through increased energy efficiency to first reduce energy demands. Likewise at the regional and national levels there have been studies that show that Europe, Germany and Australia could go 100% renewable in a relatively short period of time. There will of course be many who will continue to dismiss renewables as the way forward for Japan, despite recent events. They will try to convince the Japanese public to continue with business-as-usual and that it should not take too long for things to get back to “normal”. But if the goal for Japan is to create a secure, low carbon, resilient and safe energy system, then now may be the appropriate time for an objective assessment that will, by design, include decentralized, local energy systems connected to a smart national grid. At the very minimum, such an outcome will hopefully fix the country’s problem of having half of the grid operating on 50hz and the other half on 60hz, a legacy of the Meiji Period and the continuing and controlled power of the industry giants. For Japan and elsewhere, nuclear power is a short-term solution with very long term problems that include the costs of decommissioning nuclear plants and of dealing with the resulting nuclear waste. At present, Japan is still searching for the final disposal site for its nuclear waste (after reprocessing) and this remains an issue for many countries. The waste has to be buried deep underground (300–1000 metres below the surface) while we wait for the radioactive elements to decay over many thousands of years. Surely this fact alone is convincing enough that we really do need an energy shift in response to Japan’s continuing nuclear accidents. What do you think? Can Japan Go 100% Renewable by 2050? by Brendan Barrett is licensed under a Creative Commons Attribution-NonCommercial-ShareAlike 3.0 Unported License. I wish more people would venture a comment! Surely energy is a – and arguably THE – critical topic of our day. I’m not an advocate of nuclear, but I’ve been seeing quite a bit more about thorium reactors of late. At least in theory they appear to represent the “lesser of two evils” compared to, say, uranium or mox reactors in that they’re inherently safer both during energy generation and after retirement. On the other hand, thorium reactors still represent centralized power production via a highly-leveraged technology (that is still all but vaporware). Further, one wonders whether supplying more power to an already power-addicted world will curtail our fledgling motivation for much-needed conservation measures and only serve to hasten the depletion of other scarce resources. Brendan, I particularly like the pathway described in this article…a combination of conservation and scaling up of renewables. This is clearly an energy shift we would all do well to make. “It is such composed and visionary thinking that will serve as a solace to Japan. Great article! Now is the time to set the road for our energy future. About the area needed to replace nuclear power in Japan by solar: 50% is wrong, it is actually below 2%. Still, the article is very nice and I am thinking if I personally really need vending machines and pachinko, if on the other hand we could turn off a few nuclear power stations without them. (I just checked the numbers for vending machines, and in fact for my (very simple) calculation, it would be roughly 3 nuclear power plants that could be turned off without them. How much other wasted energy is there in the world, and why are we doing this to ourselves?? Good questions, that’s the sad part of our society.